Your body needs all three macronutrients – protein, carbohydrates and fat – to function properly, but various weight-loss diets dictate the amount of each to eat in a day. Evidence suggests that low-carbohydrate diets can help you lose weight and may also have some health benefits, like lowering triglycerides that contribute to heart disease. The Atkins diet is probably the best known of the low-carb diets, and contrary to what you might think, it’s not just about eating all the protein you want. Atkins has four distinctive phases in which you increase the carbs in your regimen over time. Because vegetables contains carbs, you need to know which you can eat – and when – on the Atkins diet. The Atkins diet is no longer one monolithic regimen; it now consists of two diets, Atkins 20 and Atkins 40. The standard Atkins diet created by cardiologist Robert Atkins, M.D., in 1972 and updated in the 1990s is now called Atkins 20. According to the Atkins website, it works best if you are trying to lose more than 40 pounds, are diabetic or pre-diabetic, or have a waist measurement of 35 inches for women and 40 for men. In contrast, Atkins 40 is for those who have fewer than 40 pounds to lose or who are pregnant or breastfeeding. This plan is more flexible, offering a larger selection of foods all around, and has no distinct phases. Discuss with your doctor whether the Atkins diet might be right for you, and which version would work best for your weight-loss needs. In the first few weeks, or induction phase, of the classic Atkins diet, you are allowed only 20 to 25 net carbs per day. Twelve to 15 of those net carbs should come from so-called “foundation” vegetables. You calculate “net carbs” by deducting the amount of fiber in a food from its total carbohydrates. So, if a vegetable contains 20 carbs per serving but also offers 4 grams of fiber, the net carbs is 16. Atkins’ foundation vegetables are nutrient-dense, tend to be higher in fiber, and include a host of generally low-calorie, non-starchy vegetables. 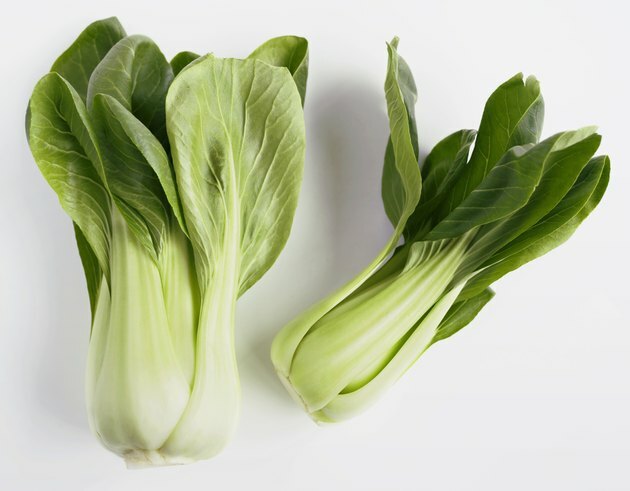 You can enjoy all varieties of green leafy vegetables, such as kale, spinach, collards and chard; all cruciferous veggies like bok choy, broccoli, cabbage, cauliflower and Brussels sprouts; and other non-starchy vegetables like asparagus, bell peppers, celery, cucumber, eggplant, garlic, green beans, kohlrabi, leeks, okra, red or white onions, rhubarb, scallions, snow peas, yellow squash and zucchini. In general, the serving size for most of these vegetables is about 1/2 cup. In the first phase of the Atkins diet, you are allowed some root vegetables and squash, including pumpkin, spaghetti squash, turnips, jicama, radishes and fennel. Avocados and tomatoes, though technically fruits, are also deemed acceptable "vegetables" in this phase, as are black olives, hearts of palm, mushrooms, sprouts, dill pickles and marinated artichokes. In Phase Two of Atkins, you increase your net carb intake by 5 grams at a time. Feel free to vary your vegetable intake with some legumes; you can enjoy a quarter-cup of beans such as kidney, lima, pinto, black and navy beans, as well as chickpeas. In Phase Three, when you’re within 10 pounds of your target weight, you can add 10 net grams of carbs daily, as long as you continue to lose weight, and bring some starchy vegetables back into your regimen. These include cooked carrots, beets, rutabaga, acorn and butternut squash, parsnips, peas, corn, sweet potatoes and baked white potatoes. By Phase Four, you’ve reached your goal weight. In this maintenance phase, you are free to experiment with all the vegetables from the previous stages of Atkins, as long as you continue to maintain your weight. In contrast to Atkins 20, on Atkins 40 you can eat any vegetables, even starchy ones, from the very first day; you do not need to phase anything into your plan. Simply limit yourself to 15 net grams of “foundation vegetables” each day and 25 net grams of all other carbohydrates, including starches like potatoes. When you are 10 pounds from your target weight, you can add 10 net grams of carbs a week. What Vegetables Are High in Carbohydrates?